Helping hands: Vintage zinc glove molds at the bi-annual brocante and ham fair at Chatou, France. When I started blogging in January, 2006 any blog that proved successful produced original content, driven by a clear personal voice. Over the past eight-and-a-half years, blogging sadly has evolved into a more commercially-propelled platform. Advertisers ferret out blogs that receive a bit of traffic and hope to monetize that blog's readership. 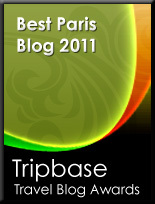 Don't get me wrong: I'm not against blog advertising per se. I have a handful of blog sponsors' ads in my sidebar. These ads cover annual costs of my domain name and blog host. But I am opposed to advertising-sponsored content that infiltrates blog posts, suppressing a blogger's own unique voice. "My name is Danny Thomson and I am a writer at TheOutreachers.com, a relatively new social media agency. "I was just wondering if you would be interested in us contributing a guest post for your site? "We've done many before, and can provide examples of published work if desired. "I have just been on tarabradford.com. Love the style of your content - you have a truly defined style to your site and I would love to contribute in a similar vein! "I am writing to you today to see if you would be interested in accepting an article for your website. I am working for specialist authors for a period of time to hone my writing skills before I hopefully move into full onto a journalism job and I need to get as much content under my belt as possible. "I would love to collaborate with you on topic and style. This service is completely free if we could include one hyperlink in the article. This would be from a relevant partner and would be in the (sic) completely in context with the content. The pieces I have had accepted so far were around 500 words in length and some people like to be involved others just like me to suprise them! "The content will be compelling and I am sure your visitors and social followers will love to read it! "Please let me know what you think, I look forward to hearing from you soon! Note the above writer claims he wants to "hone" his writing skills to "hopefully move into full onto a journalism job (sic)" and get "as much content under my belt as possible. "(Fat chance! He didn't even proofread his letter). Despite his stated inexperience, he supposedly is the company's editorial manager. And the SpecialistAuthors.com site for which he works claims "...experts are standing by!" Such messages not only are vague and impersonal, the authors haven't bothered to do any research before approaching me. If the advertisers read my About page - the absolute minimum one should do before approaching a blogger - they'd learn that I do not accept paid, sponsored or guest posts. I clearly state that all advertising on my site is paid on a yearly basis. Further, If these content-mill employees read even a handful of blog posts, they would discover my antipathy towards sponsored blog content. But content-mill employees - who consider blogging strictly as a commodity - haven't done their homework before approaching potential targets; they're simply too lazy. Instead, apparently they consider if they send enough queries to enough bloggers, sooner or later, someone will bite. In my view, if a blog doesn't maintain its original voice, there's no point reading it. I think that sponsored posts - rightly or wrongly - undermine bloggers' credibility. Over the past year, I've been disappointed to find a few of my favourite bloggers repeatedly embracing sponsored content, with their own lively voices tempered to satisfy fickle advertisers' wishes. To me, blogging and advertising should emulate the separation of church and state. While these entities may at times cooperate, neither requires interference - or influence - from the other. What's your view of blog posts consisting of paid, sponsored content? Here's another thing about blogging: You don't need to take a class to learn to blog. Truly. It astonishes me that so many people offer online classes advising newbie bloggers how to be "successful." But there are no secrets; just write from your heart! Write about your experiences; about what interests you; about your hopes and challenges. Use your unique creative talents; don't let someone else try to meld your originality to a passing fad or trend. And don't allow advertisers to hijack your blog, replacing your bright ideas with "cookie cutter" content - not-so-cleverly disguised to sell products or services! Just be you. Traditional dress in the Nord-Holland town of Edam. Here in the Netherlands, we're gearing up for Koningsdag or King's Day. Celebrations have begun honouring King Willem-Alexander. On Saturday, virtually the entire country will be awash in a sea of Orange! All photographs taken at Edam's world-renowned kassmarkt or cheese market. Click images to view detail. As you may have noticed, over the past few days, my blog was down. The site host Typepad - which has provided stellar service during the past 8 1/2 years of blogging - was hit by a series of distributed denial-of-service attacks. It's no surprise that Typepad rose to the occasion and restored service as quickly as possible. Meanwhile, spring has erupted in full bloom, both in our newly-streamlined garden (pics coming soon) and via lovely flower crowns, handmade by my daughter Jordana. We've planted six blue hydrangeas (or hortensia), in a nod to both my late grandmothers. When I was a child, their yards were filled with blue hydrangeas (and some pink ones as well). Jordana (right) has created numerous flower crowns for spring festivities including pageants, parties, plays and weddings. Her lovely friends are modeling the designs, available in her Etsy shop Outrageous Babes. The decorative crowns also make fun and original gifts! See more one-of-a-kind flower crowns at Outrageous Babes. P.S. On Twitter, I'm @TaraBradford and I am participating in #100happydays (aka #100daysofhappiness). Won't you join in and tweet about your own daily reason to be happy??!! Or you can participate on Instagram or other social media sites. Leonidas Belgian Easter chocolates and tea in Louise Campbell's Multicoloured Elements hand-painted porcelain for Royal Copenhagen. Wishing you and your family a very Happy Easter holiday! Remembering the remarkable writer and Nobel laureate Gabriel Garcí­a Márquez with an excerpt from his "farewell letter:"
"...I have learned that everybody wants to live on top of the mountain, without knowing that true happiness is obtained in the journey taken and the form used to reach the top of the hill. I have learned that when a newborn baby holds, with its little hand, his father's finger, it has trapped him for the rest of his life. "I have learned that a man has the right and obligation to look down at another man, only when that man needs help to get up from the ground. Say always what you feel, not what you think. If I knew that today is the last time that that I am going to see you asleep, I would hug you with all my strength and I would pray to the Lord to let me be the guardian angel of your soul. If I knew that these are the last moments to see you, I would say 'I love you'. There is always tomorrow, and life gives us another opportunity to do things right, but in case I am wrong, and today is all that is left to me, I would love to tell you how much I love you and that I will never forget you. "Tomorrow is never guaranteed to anyone, young or old. Today could be the last time to see your loved ones, which is why you mustn't wait; do it today, in case tomorrow never arrives. I am sure you will be sorry you wasted the opportunity today to give a smile, a hug, a kiss, and that you were too busy to grant them their last wish. "Keep your loved ones near you; tell them in their ears and to their faces how much you need them and love them. Love them and treat them well; take your time to tell them 'I am sorry';' forgive me',' please' 'thank you', and all those loving words you know. Nobody will know you for your secret thoughts. Ask the Lord for wisdom and strength to express them. Show your friends and loved ones how important they are to you." 'Happily' destroying media stereotypes, one smile at a time. My apologies for my absence - both on the blog and in responding to your kind emails and messages. It's a bit hectic here: trying to improve my juggling skills, but repeatedly dropping the ball. Must do better! If you've wondered about the difference between the often-used generic reference to "Holland" vs. "the Netherlands," this clever video offers clarification (for the record, we live in the province of Noord-Holland, in the country of the Netherlands). This "cheesy" bicycle is on permanent display on a bridge in Edam, Noord-Holland (its decorations are refreshed each season). On Monday, I was in Edam buying cheese for my daughter Jordana's Easter package (photo taken with my phone's rubbish camera). "It doesn't look like a hospital, does it?" That was the initial reaction of a Dutch friend, who recently accompanied me to the hospital to see David. He's right: the glass balls suspended from the high, industrial loft-like ceiling are more akin to an art gallery than a hospital, creating a cheerful atmosphere. Photos (taken with the phone's camera) are of the main entrance at AVL, the Netherlands Cancer Institute in Amsterdam.